For years, Austin’s Waller Creek has been beset by severe flooding, erosion and water quality problems. 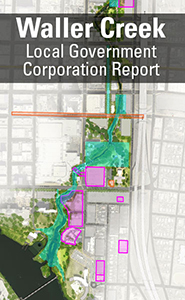 When completed, the Waller Creek Tunnel will remove more than 28 acres of downtown land from the floodplain. To watch the video, click on the picture above. The Waller Creek Flood Control Tunnel Project will consist of a stormwater bypass tunnel that will address high priority flooding, erosion and water quality problems along lower Waller Creek, which are identified by the Watershed Protection Master Plan. The mile-long tunnel will convey floodwaters by capturing and redirecting floodwater from Waterloo Park to Lady Bird Lake. 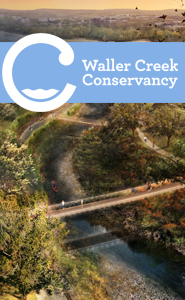 This project will create an opportunity to restore the creek and revitalize the Waller Creek District. The main tunnel is one mile long and diverts flood waters from Waller Creek, carrying the water to Lady Bird Lake. The 4th Street Creek Side Inlet diverts flood waters into chambers, called the Debris Screening Facility, where trash and debris are filtered out. Then the flood waters enter the tunnel. The outlet facility is where the tunnel releases flood waters into Lady Bird Lake. The Waterloo Park Inlet Facility diverts flood waters into the tunnel and removes trash and debris from Waller Creek. It also recirculates water from Lady Bird Lake to create a constant flow of water in the creek. The 8th Street Creek Side Inlet will capture additional flood waters that flow toward the creek downstream of Waterloo Park. Like the other inlets, the 8th Street Creek Side Inlet collects trash and debris. Since the tunnel is below the level of Lady Bird Lake, it is constantly filled with 21.5 million gallons of water.